Managers have internalized investors' well-documented size bias, EY research shows. With the competition for assets stronger than ever, hedge funds are diverging from traditional models in hopes of expanding their asset bases. According to consulting firm EY’s 2015 hedge fund and investor survey, investor appetite in alternative products means hedge funds are facing competition from managers who offer exposure to products not traditionally offered by hedge funds, such as private equity, which 56% of investors said they were either currently invested in or planning on investing in. At the same time, “the level of AUM [assets under management] necessary to thrive is not only higher than what would have been necessary in the past, but the timeline to achieve these critical thresholds is shorter than ever,” according to EY. Of hedge funds surveyed, 57% named asset growth their number one strategic priority. In particular, mid-level funds managing between $2 billion and $10 billion most aspired to higher AUM, with 70% saying it was their top goal. The second highest priority was talent management, which survey respondents said was a necessary component of asset growth. For hedge funds managing less than $10 billion, the top strategies for attracting assets were accessing new investor bases within existing markets and increasing penetration with existing client types and markets through their current strategies and products. Larger funds, however, were focusing on growing AUM by becoming a “one stop shop” for investor needs. Their top approaches to growth adding new hedge fund strategies and launching new non-traditional products. In fact, while 54% of hedge funds managing upwards of $10 billion currently identify as multi-product asset managers, 63% surveyed see themselves offering multiple product types in the next three to five years. Just 23% said they plan to stick with the traditional hedge fund offering. Smaller funds aspired to more diversified offerings, too. 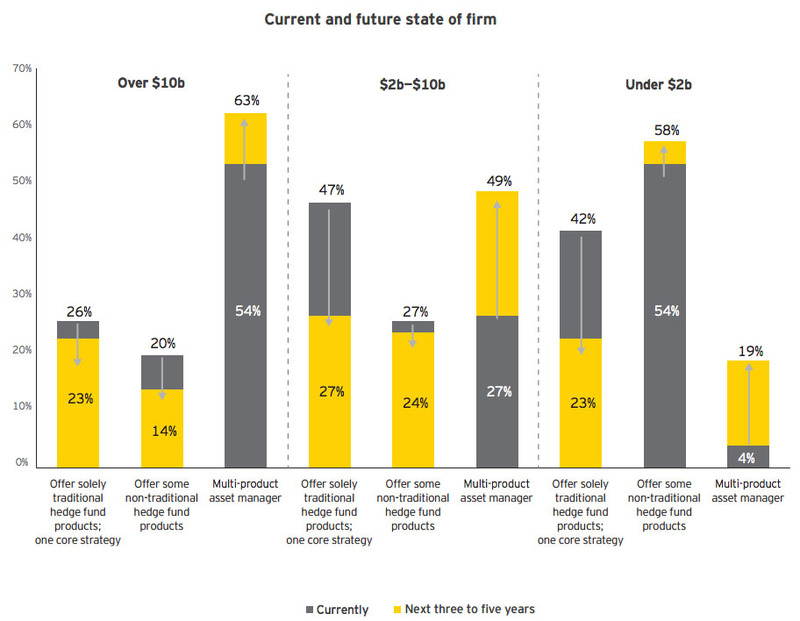 About half of $2 billion to $10 billion firms sell only the standard product, but “they realize taking the leap to a multi-product asset manager is the path forward in a maturing industry,” according to EY. Of hedge funds of this size, 49% plan to become a multi-product asset manager within the next three to five years. Even funds managing less than $2 billion plan to adapt to the changing industry, but their expectations are “more tempered,” with 58% predicting they will offer some non-traditional products in three to five years, and just 19% reaching for multi-product manager status in that time frame. So far, survey respondents said overwhelmingly that product diversification has helped their funds grow AUM, increase investor satisfaction, and improve their brand. However, these news products have also had a negative impact on operations and personnel, as well as contributing to lower operating margins. Also affecting margins were management fees, which fell from the traditional 2% to an average of 1.45%. Hedge funds managing more than $10 billion charged the highest fees, but even for those managers the average fee rate was 1.51%. This, too, was a result of increased competition, according to EY, with managers forced to be more open to negotiating investment terms if they wanted to secure assets. Of managers surveyed, 60% said they have already offered reduced fees for larger mandates.